Lexi Howard’s practice focuses on commercial real estate, including purchase and sale transactions, leasing, easements and CC&Rs. Prior to joining Murphy Austin, Lexi worked as a legislative advocate, representing real estate interests in matters related to mortgage lending and foreclosure, PACE financing, tax-deferred exchanges, real property assessment and taxation, transfer disclosures, and notary matters, including statutory, regulatory, and licensing concerns. Lexi also represented interests related to the judiciary and other trade association and business issues. From 1985 through 2010, Lexi worked for a national title insurance and financial services firm, handling commercial and industrial sale, purchase, and financing transactions; multi-parcel land trust and conservation easement transactions; and residential and personal property transfers throughout California. 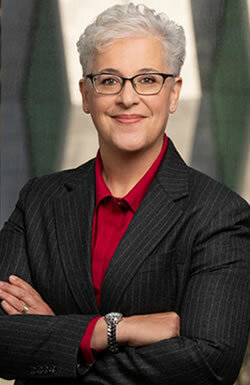 Lexi serves on the Board of the Sacramento County Bar Association, as Co-Chair of SacLegal, Sacramento’s LGBT Bar Association, and on the Advisory Committee for the Law and Public Policy Program at C.K. McClatchy Senior High School. Lexi earned her J.D. from University of the Pacific, McGeorge School of Law in Sacramento, where she received the school's Outstanding Student Service Award, served as Evening Vice President of the Student Bar Association, and as President of the McGeorge Government Affairs Student Association. She earned her Bachelor of Science in Business Management from California Lutheran University in Thousand Oaks, California. She is a recipient of the National Top 40 Under 40 Award. Draft and review various agreements for all aspects of commercial real estate matters including: purchase and sale transactions, leases, exchanges, financing, subdivisions, and easements, sales of land, road easement and maintenance agreements, covenants, conditions and restrictions, and reciprocal easement agreements. Assist in the representation of real property transactions for developers, owners, lenders, borrowers, architects, and contractors. Assist in the representation of clients on tenant and landlord sides of commercial office space leasing. Provided complete legislative, regulatory, and agency support for clients, including all aspects of proposal development and enactment for the development of statutory and regulatory proposals.